What is Parent Education and Why Do Some States Require It? Divorce is not easy on the parents or the children. Families have increasingly relied on the courts to resolve divorce issues and problems including child custody, visitation, child support, paternity, emergency protective orders, and restraining orders. As a result, courts have found that parental conflict related to divorce is a societal concern because children suffer potential short-term and long-term detrimental economic, emotional, and educational effects during times of family transition due to divorce. To address this concern, many courts have decided to mandate parent education classes. What states require parent education classes? 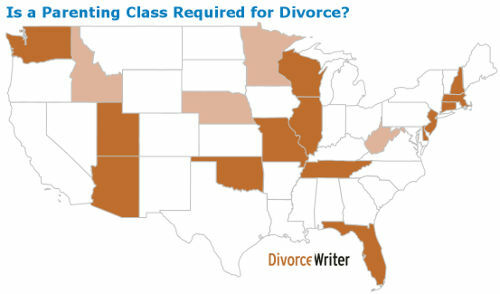 Idaho, Minnesota, Nebraska, and Virginia require ALL parents filing a contested divorce to attend a parent education class. The rest of the states either leave it up to the judge's discretion or only mandate parent education classes in certain counties or judicial districts. Alabama Mandatory in Calhoun County. Alaska Mandatory. Parties must watch a video at the court or online OR take an online class. Fees: Video is free at the court, or can be viewed online for $10. Online class is $39.95 for 30 day access. California Depends on the court. For court ordered parenting classes, an on-line class is usually not accepted unless specifically ordered. You must take they type of class ordered by the judge. Colorado Some courts require the parties to attend a Children and Families in Transition Seminar (CFIT), which are usually three hour sessions designed to help parents understand what their children are going through during a divorce. Connecticut Mandatory for parents in a divorce case with children under age of 18. Delaware Mandatory for all parents in divorce cases with children under the age of 18. Parent education programs are a 6-8 hour course to help parents cope with a divorce or separation. Fees: Each program sets its own fee, but the fee may not be more than $100 per parent. District of Columbia At judge's discretion. Florida Mandatory. All parties to a dissolution of marriage proceeding with minor children or a paternity action that involves issues of parental responsibility shall be required to complete the Parent Education and Family Stabilization Course prior to the entry by the court of a final judgment. Fees: Program providers must charge a "reasonable" fee. Typically, costs range from $18.00 to $39.00 per person. Hawaii Mandatory. All divorcing parents and their children between the ages of 6 and 18 must attend the Kids First program and view the video entitled "The Purple Family." Idaho Mandatory for all parents with child custody issues before the court are ordered to attend the Focus on the Children classes. Illinois Illinois requires parents to attend a parenting education class before the judge decides a divorce. This class teaches parents ways that they can act to avoid hurting their children during the divorce. Both parents must take this class within 60 days after the first meeting with the judge. The course is at least four hours long. Kentucky At judge's discretion, but more than half of Kentucky's 56 judicial circuits have some form of Divorce Parent Education. Maryland Some circuit courts require all parties in contested family cases involving children to attend these classes. A co-parenting class may discuss: how divorce impacts children and parents emotionally; changes in the parent-child relationship; transitions between households; communicating with children and with the other party; problem-solving, decision-making; and other topics. Massachusetts Mandatory. All divorcing parents with children under the age of 18 must take a parent education class. Fees: Vary depending on provider. Michigan Most counties require divorcing parents with children under the age of 18 to attend a two hour Start Making It Liveable for Everyone (SMILE) program. Minnesota Mandatory for parents who have children together and if they have contested custody or parenting time issues. Check your district court website for a list of approved divorce classes. Fees: Vary depending upon provider. Mississippi Only required in 16th District. Missouri All parents in a dissolution of marriage, legal separation or paternity action in which there are minor children (17 years and younger) are required to attend a Parent Educational Program. Petitioner shall attend within 45 days of the filing of the original petition and Respondent shall attend within 45 days after service of process. Parents may attend the court-sponsored program or any program approved by the Administrative Family Court Judge. Fees: Free if you attend a program in your county. $30 per parent if attending a class in another county. Nebraska Mandatory for parents filing a contested divorce. Nevada Required in some counties. New Hampshire Mandatory. All parents filing for divorce with minor children must attend a four hour child impact seminar called "Children First." New Jersey A Parent's Education Program is mandatory for parents filing for divorce. New Mexico At judge's discretion. New York At judge's discretion. Fees: Vary by program provider, but cannot exceed $100 per person. North Carolina Only required in the 12th District. North Dakota At judge's discretion. Ohio Mandatory only in certain counties. Oklahoma As of November 1, 2014, all divorcing parents on the grounds of "incompatibility" with minor children must attend parent education classes. Judges will decide how many hours are required and whether couples take the course separately or together. Fees: Vary depending on provider, but typically range from $15 to $60 per person. Oregon Mandatory only in certain counties. Pennsylvania Mandatory only in certain counties. Rhode Island At judge's discretion. South Carolina At judge's discretion. South Dakota Required only in certain counties. Tennessee Mandatory. All parties filing for divorce with minor children must attend a four hour seminar on the impact of divorce on children. Fees: Vary depending on program provider. Utah Mandatory for parents in a divorce case. The court will not issue a decree until both parties have completed the course requirements and have presented a certificate of course completion to the court. You should complete the courses as soon as possible but no later than 60 days after filing the petition if you are the petitioner, or, if you are the respondent, no later than 30 days after being served with notice of the course requirements. Fees: The fee for the divorce orientation course is $30 per person. However, the fee for the divorce orientation class will be discounted $15 for a petitioner who attends a live class within 30 days of filing the petition, and will be discounted $15 for a respondent who attends a live class within 30 days of being served with the petition. The fee for the online course will not be discounted. The fee for the divorce education course is $35 per person. The fees for the live courses are paid to the person teaching the class. Virginia Mandatory for parents with children who have contested divorces. The court may require the parties to attend a parent education seminar or program in uncontested cases only if the court finds good cause. The seminar or other program shall be a minimum of 4 hours in length and shall address the effects of separation or divorce on children, parenting responsibilities, options for conflict resolution and financial responsibilities. Fees: The fee charged per party for participation in such program shall be based on the party's ability to pay; however, no fee in excess of $50 may be charged. Washington Mandatory. Both parties must attend a Parenting Seminar. The court may waive the seminar requirement for one or both parents in any case for good cause shown. West Virginia Mandatory for divorcing parents with children. Parent education may be waived if the court places on the record a finding attendance is not necessary, and states the specific reasons for the finding. Fees: Vary per program provider. Wisconsin Mandatory. Both parties must attend a parenting class before the divorce will be granted. The issues and procedures for resolving time-sharing and child support disputes. The emotional experiences and problems of divorcing adults. The family problems and the emotional concerns and needs of the children. Family relationships and family dynamics. Financial responsibilities to a child or children. Issues regarding spousal or child abuse and neglect. Skill-based relationship education that may be generalized to parenting, workplace, school, neighborhood, and civic relationships. The availability of community services and resources. What are the Benefits of Parent Education? When following up years later, researchers found that the program had lasting positive effects with the children who were now in their 20s. These now adult children had fewer mental disorders and substance abuse problems, and their relationships with romantic partners was a higher quality than those in the control group. What Will Happen if one or both of the parents do not attend the education class? The judge may choose not to grant the divorce or may hold a parent in contempt of court. Where do I file for divorce? DivorceWriter.com™ is the leading self-help divorce document web site.